This is what Nourish is seeking to do with our latest training programme. 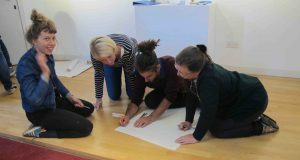 Turning the Tables will offer both an opportunity for professional development for facilitators and educators and an impetus for conversations, workshops and events about our food future across Scotland. We hope that this will bring a wider range of voices into the conversation and empower more and more people in Scotland to act not merely as consumers but as food citizens, actively shaping the food system we’re part of. The first part of this new training programme took place on the 18th and 19th of August. Sixteen participants from a wide range of backgrounds and from across Scotland gathered in Edinburgh, all with a keen interest in working with other people to change the food system in Scotland. Between now and the second half of the programme in November, the participants will be supported to run events and workshops about food system change in their own communities, ranging from trade union groups and community gardens to whole island communities. Watch this space!